UBX?M8230?CT super low power GNSS receiver chip. Photo source: u-blox. 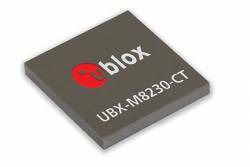 Thalwil, Switzerland–based u-blox will showcase new products — including a super low power GNSS receiver chip for wearable applications — at Embedded World, held in Nuremberg, Germany, on March 14-16, 2017. The new UBX‑M8230‑CT super low power GNSS receiver chip features the new Super‑E mode (Super‑Efficient) to provide a balance between power and performance. Compared with u-blox traditional 1 hertz full power mode, the Super‑E mode provides 3x power savings while maintaining at least 80% of position and speed accuracy in any environment, according to the company. Average power consumption over a typical 30-minute track is lower than 20 milliwatts while instantaneous tracking power is less than 10 milliwatts. The UBX‑M8230‑CT demo was recorded with a commercial product antenna and shows the path of a person running a course, using two identical designs configured one with the 1 hertz full power mode and the other with the 1 hertz Super‑E mode. The 2D accuracy and the power consumption of each configuration are then visually and quantitatively compared, thereby demonstrating the Super‑E mode’s performance in the use case of portable applications, according to the company.